[Initially posted June 13, 2003, most recently revised Oct. 13, 2003] -- Candidates are not the only ones running campaigns in New Hampshire. New Hampshire for Health Care, part of Americans for Health Care, a project of the Service Employees International Union (SEIU), aims "to make health care the central issue in the presidential primary and access to quality, affordable health care a reality for New Hampshire families." New Hampshire for Health Care has set a goal of signing up 50,000 "Health Care Voters." -Everyone, including the self-employed unemployed, un- and underinsured, and small business owners, has access to an affordable basic health plan similar to what federal employees receive. -That these efforts help control the skyrocketing cost of health care. 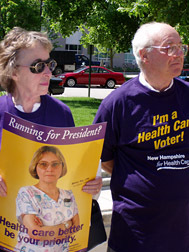 The effort started over a year before the New Hampshire presidential primary, as supporters signed up over 2,000 "Health Care Voters" on primary day in September 10, 2002. A total of 15,000 New Hampshirites have now signed up, indicating the importance they will place on the candidates' health care plans in their voting decisions. Next, New Hampshire for Health Care pressed its "Health Care for New Hampshire Resolution" during town meetings held around the state, mostly in March 2003. On town meeting day, March 11, some 300 volunteers were on the ground. One hundred and seventeen cities and towns across New Hampshire have now passed the resolution. "With over 100 communities passing the health care resolution it sends a strong message to local electeds and presidential candidates that NH is serious about addressing the skyrocketing costs of health care," stated Burgess. Like the major presidential campaigns, New Hampshire for Health Care has purchased the New Hampshire Democratic Party's voter file. In early May 2003 it put the file to use, sending out a statewide mailing to 70,000 voters. No campaign today would, it seems, be complete without polling; on June 10, 2003 New Hampshire for Health Care released results from a statewide bi-partisan poll of 500 likely general election voters and 300 likely Democratic primary voters. Sixty-three percent of Democratic primary voters said that health care would be one of the most important factors determining their vote. Speaking more generally, Americans for Health Care communications director Sara Howard said the poll showed "people are ready to talk about solutions." New Hampshire for Health Care has also been trying to build coalitions, and has united with organizations such as the Mt. Washington Valley Chamber of Commerce and the Greater Peterborough Chamber of Commerce. New Hampshire for Health Care is pursuing a variety of measures to keep health care front and center in the months until the primary. One of its earlier steps was to pay for sign inside Manchester airport. In late June 2003 it ran a radio ad statewide in a buy costing approximately $60,000 and on August 7 it started running a TV spot in a $100,000 buy. Activists participated in the Amherst and Merrimack parades on July 4th. On Labor Day New Hampshire for Health Care held a free picnic at Veterans Memorial Park in Manchester. Headquartered in Concord, where it opened up an office in late 2002, New Hampshire for Health Care has a staff of seven (photos). State director David Nassar, who served as the field director for Mark Fernald's 2002 gubernatorial campaign, started in May 2003. Before Nassar, SEIU political organizer Jay Ward coordinated the effort to sign up "Health Care Voters" around the 2002 state primary and Steve Bouchard, who went on to head up the Graham campaign, oversaw the town meeting effort. In addition to Nassar and Burgess, there are five field staff. In a May 27, 2003 e-mail, New Hampshire for Health Care's communications director Matt Burgess stated, "I firmly believe that we, and not one of the presidentials, are the most organized campaign on the ground in NH." As the year progressed the presidential campaigns added many more staff, but there is no doubt New Hampshire for Health Care has built a significant organization and network in the Granite State. National campaign director of Americans for Health Care is Ellen Golombek, former Colorado AFL-CIO president. The parallel campaign in the Hawk Eye State, Iowans for Health Care, is headed up by Sarah Swisher. There are also modest efforts in a number of other states. Copyright © 2003 Eric M. Appleman/Democracy in Action.